Framework for the process: Setting context, focus and wanted outcome. This is the foundation of the whole large group intervention, and is done before the event. With a clear goal properly set and communicated, it is a matter of letting the participants of the event take over. 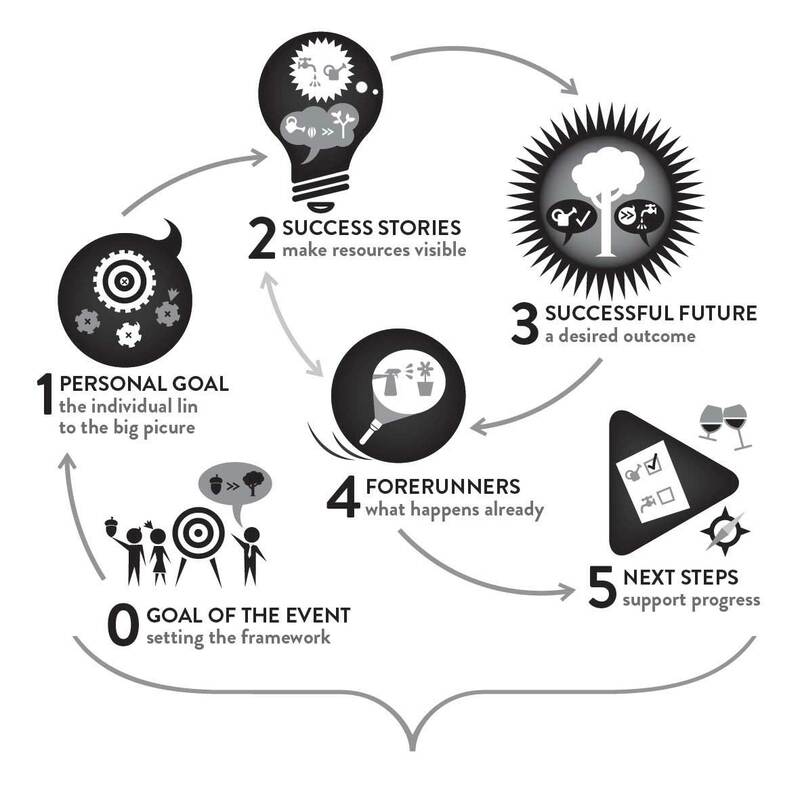 To pass on the responsibility of further actions to others, the stakeholders need to go through the five steps themselves to set up the appropriate context. How will the managers know that they are making good progression that fits the overall strategies and goals? Agreeing on an outcome. Creating a personal and common platform. Inspiring personal motivation. This is important no matter the context of the event. The company itself might want to develop a new specific strategy and that’s the context. But what does this wanted outcome mean for the manager? And how does she see herself in the big picture, here and now and along the way into the future? Share stories of success from everyday work. Confirm what works well. Telling stories from one’s own point of view based on practical experienced success opens up for sharing informal experience and know-how on what works well. Apart from being a powerful way to build relations between participants, this step also allows participants to get used to looking for what works well, and allows experts to look for sources of ideas and progression. Imagine a detailed positive future, where the strategies are already successfully fulfilled with all of the consequences this entails. Based on the future descriptions, looking at where in the organisation something similar already happens. At this point a loop back to success stories is made, comparing a wanted future with what happens today. The aim is to find actual specific actions that somehow support a way towards a wanted future. Actions that already take place and which can be reinforced and strengthened. By remembering what already works well in the company, a door is opened to existing resources that can be used in the next steps. Next steps for manager, team, company. Action plans. At this stage everything gets very practical and close to the manager. Typically they will be asked to focus on a few first next steps, literally starting right after they walk out the door. This is important in order to start a progression towards the wanted future, and to do so on a level that will be possible to follow through almost no matter the conditions.